Experience the beautiful scenery, rich history, and vibrant cultures of the South on this southern U.S. tour that begins and ends in Atlanta with overnights also in Charleston and Savannah. 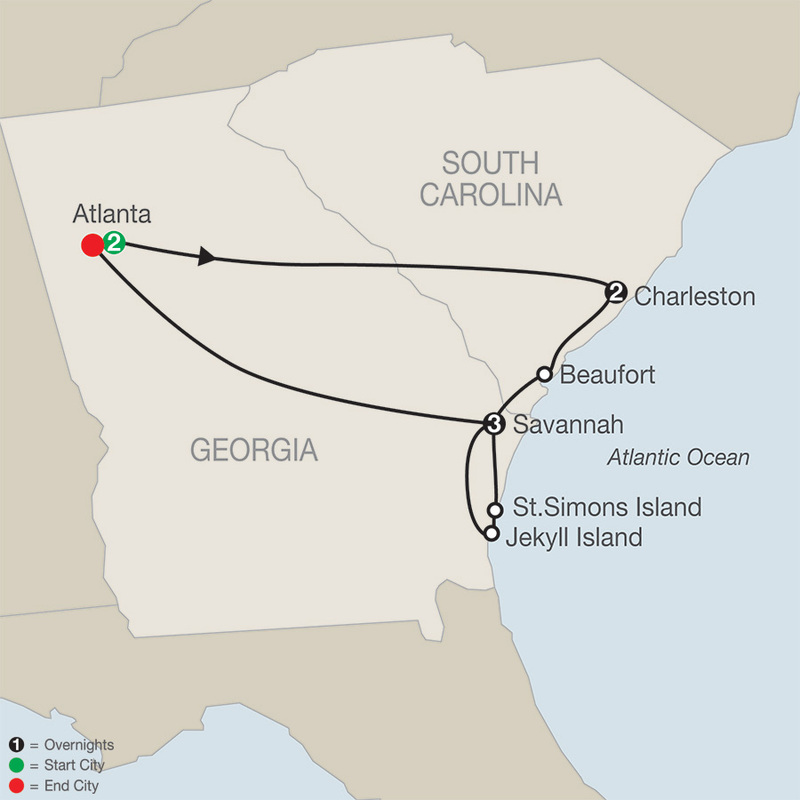 Also enjoy time in St. Simons Island, with its unspoiled beauty and beaches, laid-back lifestyle, and charming communities.History comes to life during your visits to Atlanta’s Martin Luther King Jr. National Historic Site, where you’ll learn more about the man and his legacy; Charleston’s Boone Hall Plantation & Gardens, America’s most photographed plantation and where you’ll tour the mansion, see the slave cabins, and visit the beautiful gardens; and Savannah’s American Prohibition Museum, bringing the roaring 20s to life. In Charleston, Globus has included a special Gullah luncheon, where you’ll learn about the rich history and culture of the Gullah people, the descendants of slaves who lived in the low country. Enjoy a horse-drawn carriage ride through the narrow, oak-lined streets in picturesque Beaufort and sightseeing trolley tours in both Savannah and Jekyll Island. Of course, no southern U.S. tour would be complete without sampling the flavors of the South. In Atlanta, Globus has included dinner at Pittypat’s Porch, where you’ll be immersed in southern atmosphere as you savor traditional southern cuisine. Globus has also included another special treat…a festive luncheon at the Jekyll Island Club, once a retreat for some of the world’s wealthiest families, such as the Vanderbilt, Rockefeller, and Morgan families.From the traditional southern food to the picturesque scenery and rich historic opportunities, this southern tour is a vacation of a lifetime! Day 1: ARRIVE IN ATLANTA. Welcome to Atlanta and the Peach State! At 6 pm, meet your traveling companions for a welcome drink. Your Tour Director will prepare you for your upcoming Southern adventure! Day 7: SAVANNAH. EXCURSION TO ST. SIMONS ISLAND & JEKYLL ISLAND. The Sheraton Atlanta hotel blends exquisite guest rooms and facilities with a smart design and incomparable service in a convenient downtown location. Enjoy crisp lines, artful lighting and contemporary furnishings highlighted by a brilliant modern art collection. Experience our re-energized hotel offering a fresh, new blend of chic style and boutique-inspired service. The contemporary all-suite hotel is located in the heart of historic downtown Savannah. The hotel features an outdoor pool, fitness center, and on-site restaurant with a variety of notable museums and boutique shops within walking distance.